My new “blogging office” and study table. Not a bad view. Oh my goodness!! I have arrived. After 20 hours of travel the taxi finally pulled up in front of this charming 18th century-old building on the Rue de Barthollet. I got out and smiled. Is this REAL? I get to live here? Once inside, I was even more enchanted. 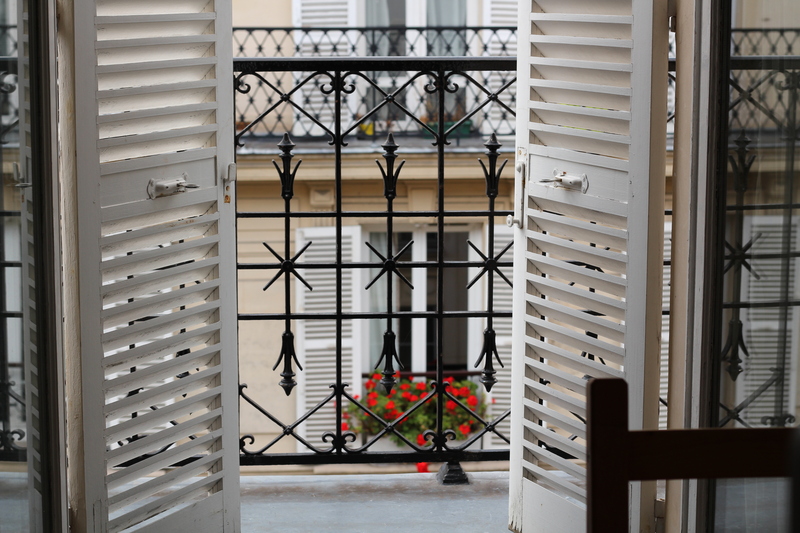 This is the quintessential Parisian flat. 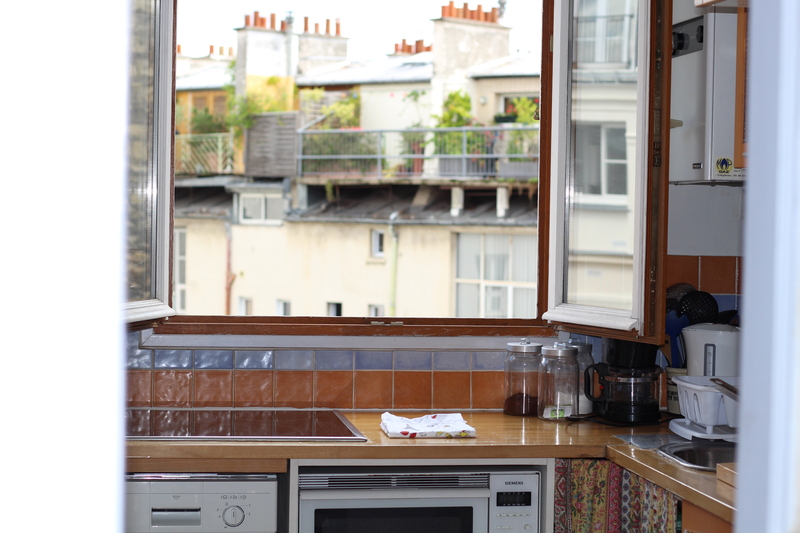 There are old stained wooden floors, white french doors~actually inside the home, a balcony with a view of the rooftops (I am up on the 5th floor), and a tiny charming country looking kitchen. No closets just an armoir with, um, 5 hangers and a toilet in a closet down the hall from the bathtub and sink….hmmm. Interesting, but so Paris. I am in LOVE. Views from my rather large balcony. I love this little flat. It’s making Paris that much sweeter. Upon arriving, I was immediately welcomed by a quintessential french woman, Genevieve. She owns the flat and like my other Parisian friend Catherine (whom I stayed with in June) she resides in a flat on the next floor ~ so she rents this one and has an almost identical one upstairs. She is an artist, yoga teacher and french language professor at the University Sorbonne here in Paris. Genevieve had a bohemian look about her wearing purple jeans and a colorful blouse. Although, many traits were still classic french. Her hair was a mess but still chic looking, she wore very little makeup and let her natural beauty shine, and she immediately pointed out that the bubble gum I was chewing would ruin my palate. How embarrassing! I need to lose my gum chewing habit while in Paris. It is non chic! She then invited me up for tea. She made a delicious cup for me – all loose leaf as she says she despises “the bags.” She mumbled something about quality. We started talking about my wine program that is about to start and she became very intrigued. Her father is from Bordeaux and so wine has always been a strong presence in her life. By the end of the talk we had decided that I would give her tasting lessons and taste her on wines I was learning about, and she would in turn give me private french language lessons. We are going to try and meet once a week in the evenings to do our exchange. After my lovely introduction, I came back down to my flat and settled in. I unpacked my suitcases, set up my room and took a nice long bubble bath. I got ready and headed out to the small market up the street. About a 6 minute walk on foot. I stocked up on yogurt, fruit, sparkling mint water, wine, cheese and jam. Then, I stopped at the Boulangerie and picked up a baguette. This is one of the reasons I moved here. I am passionate about this lifestyle and getting fresh quality ingredients by the day. I love that the french get a baguette on a daily basis fresh out of the ovens to eat with their meals. I am following suit. Tonight, I plan to stay in. 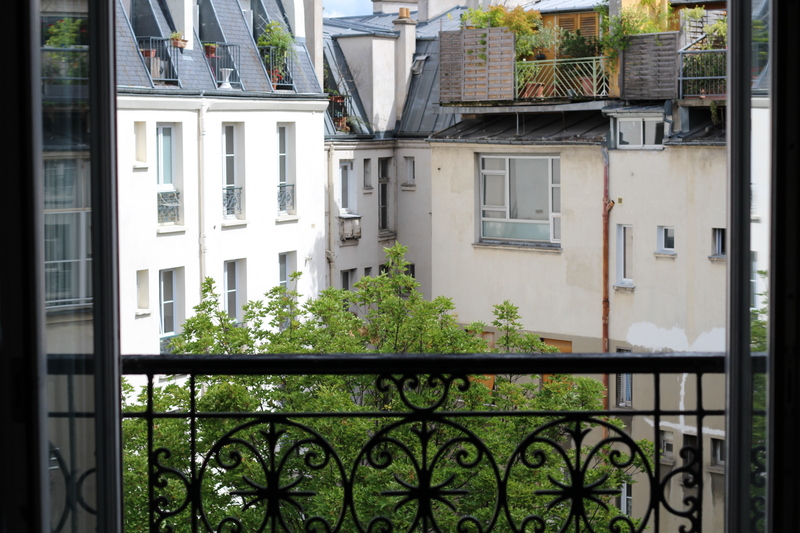 I am exhausted from the travel, BUT I will sit on my balcony and watch the Parisians go about their evening. I will be sipping a glass of wine and calling it a night ~ full day tomorrow!! Bonne Nuit. How lovely, Krista! I am going to live my dream of a little french adventure vicariously through you…can’t wait to see how your days unfold. Enjoy! Bonne nuit Krista, sleep tight mon amie! Wow!!!! Such a charming “flat”!!! Love it, and having a tour of your place!!! Feel ever so much better inside to actually see how you are living! 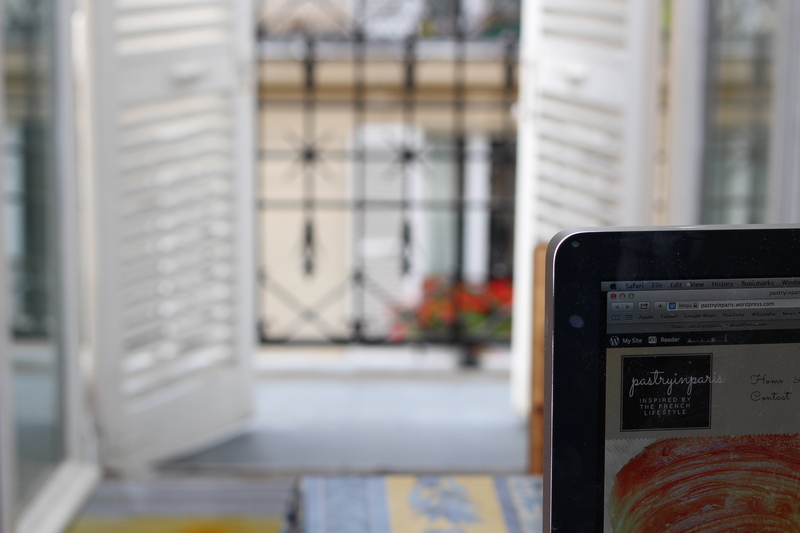 So happy that you have friends too – nice set up with neighbor to tutor and enjoy some tea & wine together!! Yes Grandma ~ I am glad you got to see it so you and Gpa won’t worry so much 🙂 Love you! It is very charming and the views are fantastic! I’m going to Paris this Sept/Oct with Tonya’s group and I’m counting the days. Seriously cannot wait! My second week I will be renting an apartment in the 7th. I hope it is as charming as this one. Stephanie- Oh my goodness! I think I will get to meet you then! I am attending the dinner sept 27th with Tonya. I am sure your flat will be so charming! Yay! I will also be at that dinner. There is something going on in the city that day where they are stopping all cars from entering city central just on the 27th. South of Blvd St. Germain will not be affected but north of it will, as well as a lot of the right bank. Hopefully the metro will still be open! I look forward to meeting you. What a beautiful little nest to welcome you home Krista! It is all you need but WOW! Thanks Angie! I feel the Wow factor big time too! So beautiful, so you! Can’t wait to travel to you next !!!! does the great kitchen mean you will be cooking for us all afterall??? I think wine for language is the perfect lesson swap! I love your place. Five floors…hmmm…you will be able to eat a lot of pastry 😉 Sending a hug and all good wishes from Bill and me. Is it a problem that I cry almost every time I read your posts? I guess it’s just been recently. Because this is actually happening. You are THERE! Living your dream and allowing all of us to root for you every step of the way. I thought I was excited to visit before… after seeing these pictures, I’m counting down the days! LOVE YOU SIS! Krista–Your adventure is like a romantic novel or movie! The apartment is so perfect. 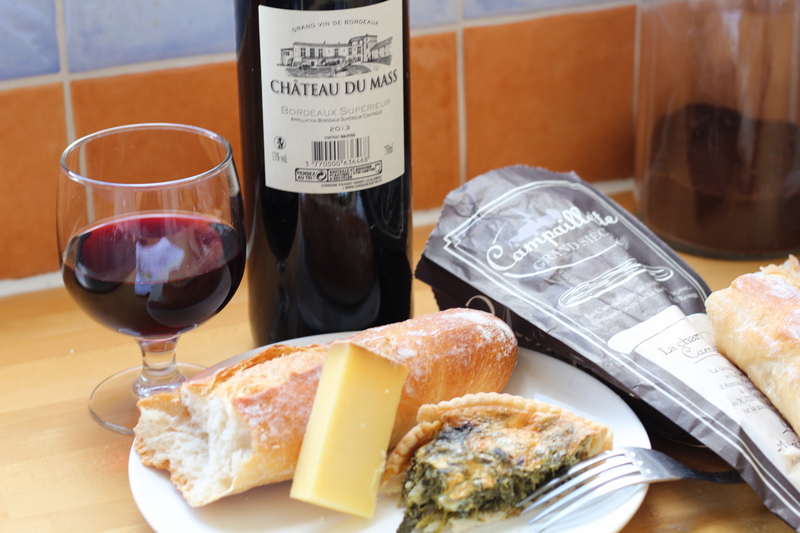 Love the photos could almost taste the wine and baguette! Looking forward to the next day’s journeys. Danette ~ I love that “could almost taste the wine and baguette.” It feels like I am in a movie- lol. Merci beacoup! Seanne! Thank you so much. So glad you are reading! That looks so lovely Krista. I’m trying very hard not to be envious. What a lovely experience you are going to have! 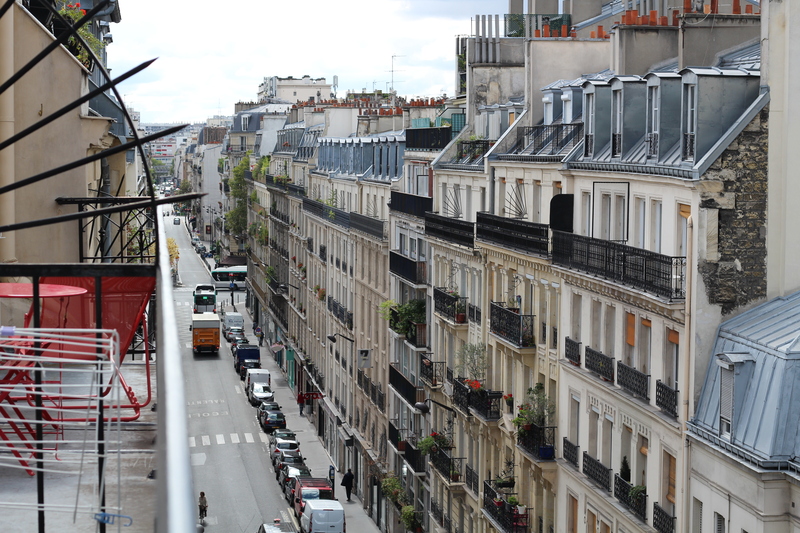 So happy things went smoothly for your first day living in Paris! 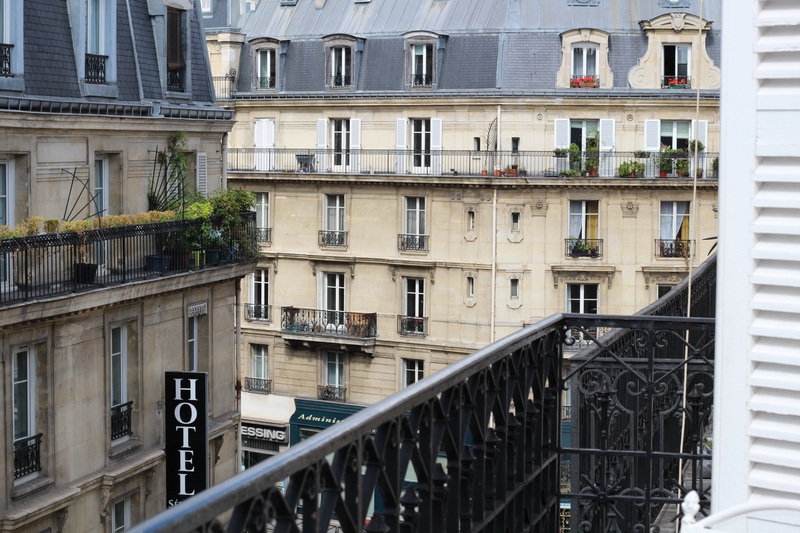 I can’t wait to see what your next adventure in Parisian living will be! God bless you!